My friend Gary France had this idea/challenge for us bloggers to take a picture in the center of the road including the center line anywhere in the world but the picture had to be taken on May 1st and include the blogger. You can read about the challenge here "USA Tour on a Harley Davidson"
So my plan was to ride to the George Washington Bridge just north of Manhattan and get a picture underneath the bridge. The road leading down to the park is quite twisty and steep from Fort Lee in New Jersey. 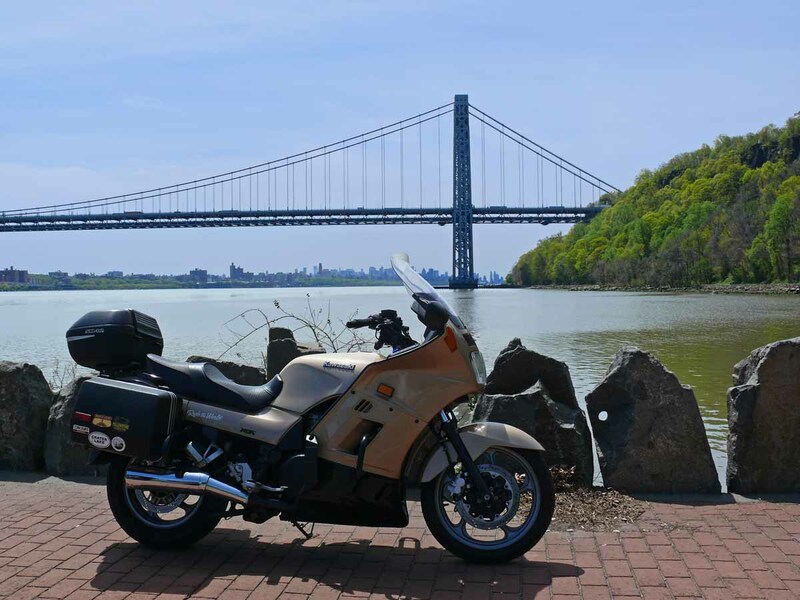 The Fort Lee Historic Park is under the bridge and you can see Manhattan in the background. I left my house with a friend and didn't get back home until almost 9pm on Sunday, May 1st which means it's already May 2nd when I finish posting this entry in the UK. 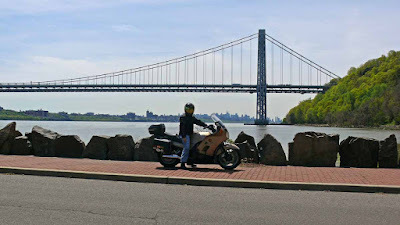 We did over 220 miles on today's ride and I will make another entry on my blog with the entire day's ride but for now I will just post the important picture. To my disappointment when I got there after riding about 60 miles I discovered the center line had long disappeared so I'm including a picture with a fake center line on the road I'm on and also on the road above me. I am happy that I was able to take the picture because there was a police man guarding the bridge and he told my friend, when he saw me walking around with a camera, that I was not allowed to take pictures by the base of the bridge, apparently because of terrorism worries. My friend convinced him I was a nice guy. Very creative! This is just great fun, isn't it? Heh, love the yellow lines! Hello from Wales, UK. Those are some pretty amazing views you have there. Love it George!!! Way to improvise!!! I had to as well, but not as well as you!! hahahaha! Great pictures! Glad your friend convinced the policeman that you were a nice guy. I can't imagine getting a phone call from a detectives' office advising that you had been detained for taking pictures. Yikes, way to give me a heart attack. I like it. Good job. Your friend did a good job convincing the police that you were OK, after all you are one of those speed loving, crazy, mean bikers aren't you - oh wait a minute - that could be me. Never mind. What a great idea. I love this! I think Gary is going to have a hard time choosing. They are all very good! 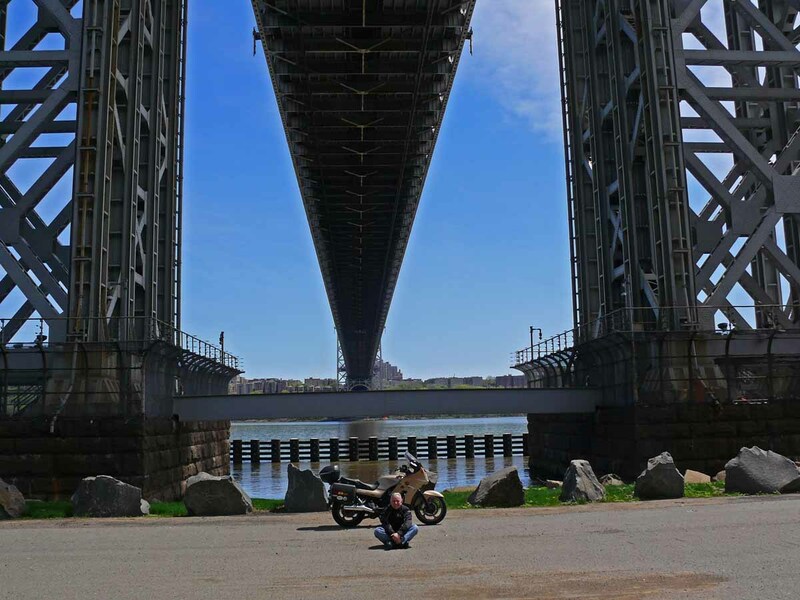 I really wanted to take the picture under the bridge. I hope so, if we do this next year I better have the Tenere. Thank you :-) I looked at your profile but couldn't find your name, I'm sure it's in one of the comments somewhere. Thank you :-) I agree, it's going to be tough, there's lots of great pictures. My friend told me when he came back to his bike. Two centerlines at once! Well done. 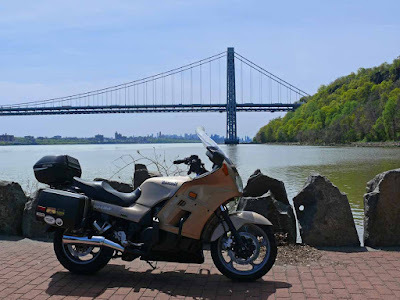 My name is Jack Riepe and I am the publisher of Twisted Roads — The blog for raw moto-dventure and romance like broken glass. I saw your picture beneath the the George Washington Bridge, and I gasped. 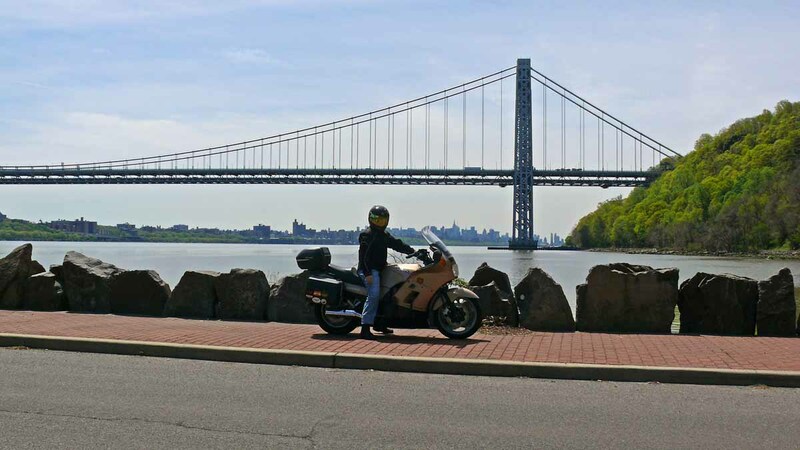 As a kid growing up in Jersey City, I used to ride my ten-speed bike up River Road (from North Bergen, NJ), and down along the Hudson River in Palisades Interstate Park. I keenly remember having lunch at the base of the bridge, and the thrill of coasting down the road at the foot of the cliffs. It is y intention to take a ride like this — with my BMW K75 — this summer. Thanks for the great memory jolt. May I link to your blog on my list of preferred "blog" destinations? DOT couldn't hire me, I would finish the job too quickly for them ;-) that wouldn't be good for the Fat Kats. See you soon on another ride. I suddenly have this urge to ride upside down and make like a bat!